This is for you, US importers. Please note the content below is just a supplementary to the sea freight page. APHIS (Animal and Plant Health Inspection Service) A major division of the USDA charged with inspecting animal and plant products. APHIS, consists of sub-organizations, including Plant Protection and Quarantine (PPQ), which inspects shipments of plants, plant products and a very few animal based products, and issues phytosanitary inspection certificates, and Veterinary Services, which examines live animals and issues health certificates. This agency is also responsible for inspection of all imported goods within the above categories. APHIS administers the wood packing material program. BATF (U.S. Bureau of Alcohol, Tobacco and Firearms) This is a US Government agency, commonly referred to as BATF (or sometimes ATF), under the U.S. Department of the Treasury, and is responsible for implementing, administering and enforcing U.S. federal laws and regulations which govern and tax the manufacturer for commerce in and use of alcoholic beverages and other products which contain taxable alcohol, such as perfume and distilled alcohol used for fortifying wine and other beverages; tobacco products, including cigarette papers and tubes; firearms, ammunition, destructive devices and all items on the U.S. Munitions List (USML). CBP (U.S. Customs and Border Protection) This agency under the U.S. Department of Homeland Security (DHS) commenced operation as of March 1, 2003. This Bureau is responsible for enforcing all U.S. laws relating to importation, exportation and immigration as they affect people, conveyances and cargo crossing U.S. borders and ports and airports of entry/exit, and for the collection of duties and taxes due upon importation. Formerly known as the U.S. Customs Service. DHS (U.S. Department of Homeland Security) Created on March 1, 2003 from 22 legacy agencies, DHS has three primary missions: Prevent terrorist attacks within the United States, reduce America’s vulnerability to terrorism, and minimize the damage from potential attacks and natural disasters. DOC (U.S. Department of Commerce) A cabinet-level department of the executive branch of government. Several DOC functions are of importance to the U.S. international trade community. The Bureau of the Census gathers and reports export and import trade statistics through the Foreign Trade Statistics Regulations (FTSR), and the U.S. International Trade Administration (ITA) promotes and administers most U.S. exports. The U.S. Bureau of Industry and Security (BIS), under the ITA, administers the Export Administration Act (EAA) through the Export Administration Regulations (EAR). The DOC also protects U.S. industry through the investigation of unfair foreign trade practices and issuing antidumping and countervailing duty orders. DOS (U.S. Department of Transportation) The cabinet level agency of the U.S. government responsible for regulating, among other things, the shipment of hazardous materials (HAZMAT) via all modes of transportation within the U.S. and U.S.-international trade. DOT also regulates the importation of motor vehicles and vehicle equipment. EPA (U.S. Environmental Protection Agency) This is the independent US government agency responsible for wide-ranging environmental protection, research and educational functions, including a variety of rules and regulations which affect the transportation of environmental pollutants, engine emissions by transportation conveyances, and certain chemical products moving in international trade. F&W (U.S. Fish and Wildlife Service) The U.S. Fish and Wildlife Service is a bureau within the U.S. Department of Interior. The Service is responsible for the protection, conservation, and enhancement of fish and wildlife and their habitats. Assisted by the CBP, the Fish and Wildlife Service regulates imports into the United States that fall within its jurisdiction, including products manufactured using materials derived from protected species. They also manage the enforcement of the U.S. Endangered Species Act, and the international CITES (Convention on International Trade in Endangered Species of Wild Flora and Fauna) convention for protection of endangered species. FCC (U.S. Federal Communications Commission) The FCC is an independent U.S. government agency, directly responsible to Congress. The FCC was established by the Communications Act of 1934 and is charged with regulating interstate and international communications by radio, television, wire, satellite and cable. The FCC’s jurisdiction covers the 50 states, the District of Columbia, and U.S. possessions. The FCC also regulates the importation of radio frequency devices. FDA (U.S. Food and Drug Administration) The U.S. government agency responsible for regulating pharmaceuticals, cosmetics, medical devices, tobacco products, and food. FDA has export jurisdiction and export license authority over certain drugs, biologics and medical devices. FDA monitors the importation of pharmaceuticals, cosmetics, medical devices, foodstuffs, ceramic dishware (and other items used to serve and store food), televisions and computer monitors for radiation emission, and many other products via the CBP Customs entry process. FMC (U.S. Federal Maritime Commission) The independent U.S. agency created by Congress to commercially regulate foreign and inter-coastal ocean commerce. 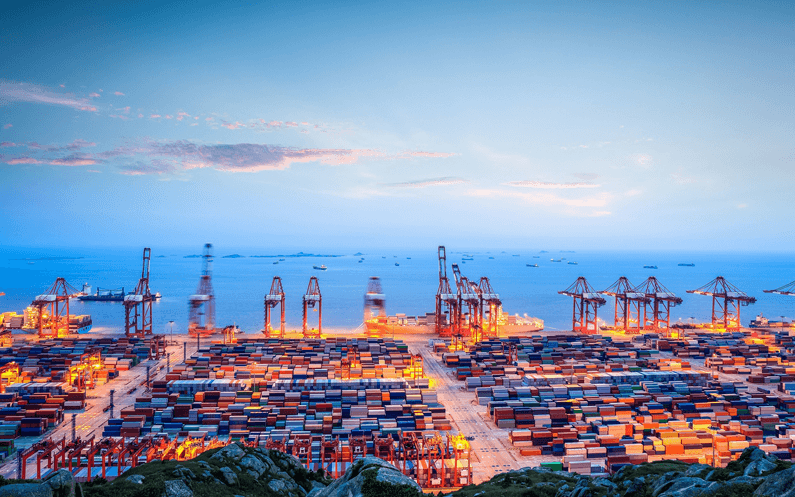 The FMC licenses ocean freight forwarders, and requires comprehensive tariff filing by Vessel Operating Common Carriers (VOCC) and Non-Vessel Operating Common Carriers (NVOCC), ocean and inter-coastal carriers, shipping conferences and ocean terminals. IATA (International Air Transport Association) The commercial association representing numerous (but not all) international air carriers. IATA establishes HAZMAT regulations for air carriage, promulgates rules on interline agreements and accounting clearing procedures, and has at various times exerted influence over rates and service among its members. IATA also acts as a representative of its airline members in screening and appointing air cargo agents, and offers training and airway bill (AWB) clearing house services to the international airfreight forwarder industry. OFAC Office of Foreign Assets Control) OFAC, part of the U.S. Department of the Treasury, is responsible for country-oriented controls. OFAC administers and enforces economic and trade sanctions against targeted foreign countries, terrorism sponsoring organizations, and international narcotics traffickers. The OFAC website provides information on these sanctions as well as the complete list of Specially Designated Nationals and Blocked Persons (the “SDN list”). OGA Other Government Agencies. This refers to agencies other than U.S. Customs and Border Protection. CBP is responsible for enforcing the laws and regulations of over 40 OGA’s. U.S. Census Bureau A sub-agency of the Department of Commerce. Among many other functions, Census collects, tabulates and publishes U.S. trade statistics. USDA (United States Department of Agriculture) The agency of the federalgovernment charged with regulating agricultural (plant and animal)products. As our national agricultural agency, the USDA must overseethe export and import of agriculture products, and issue animal healthcertificates, plant phytosanitary inspection certificates, and sanitaryinspection certificates on products within its jurisdiction, as required byforeign governments for products exported from the U.S.
Importer Security Filing A regulation intended to satisfy provisions outlined in the Security and Accountability for Every (SAFE) Port Act of 2006, which requires the submission of additional data elements for improved highrisk targeting. Importers are required to electronically submit 10 data elements 24 hours prior to loading; carriers are required to electronically submit 2 data elements. ISF data will be used to betterassess and identify high-risk shipments to prevent terrorist weapons and materials from entering the United States. 24 Hour Manifest Rule This term refers to a CBP regulation which requires all ocean carriers, including NVOCCs, to submit detailed cargo manifest information to CBP at least 24 hours prior to loading of all intermodal containers and breakbulk cargo onto a vessel at a foreign port destined to a U.S. port. The 2002 24 Hour Rule has been incorporated into an expanded set of Advance Electronic Information requirements, published in final rule form in December 2003, applicable to all U.S. import as well as export cargo via all transportation modes. Under the initial as well as the subsequent rules, the 24 hour advanced notice to CBP applies both to cargo that will be unloaded at a U.S. port, including in-transit cargo, aswell as cargo destined to non-U.S. ports remaining on-board the vessel during U.S. port calls (FROB cargo). ADD (Antidumping Duty) Dumping is the sale of goods to the United States at less than fair market value, usually when less than comparable goods are sold in the domestic market of the exporter, and there is injury or a threat of injury to U.S. industry. Antidumping duty is assessed when a foreign manufacturer sells to the United States at less than a fair value AND there is an injury or threat of injury to U.S. industry. The antidumping margin (or AD duty rate) is set to represent the difference between the fair market value of the merchandise and the exporter’s sale price. ADD margins may be specified by manufacturer. Bonded Warehouse A bonded facility used exclusively for the storage of imported merchandise. An importer may store goods in a Customs bonded warehouse and defer payment of Customs duty until the goods are withdrawn for consumption from the bonded warehouse using a Customs warehouse withdrawal. A warehouse entry secures the release of imported goods and permits their deposit in a bonded warehouse. A warehouse withdrawal may be for consumption, for transfer to another warehouse, for transportation to another port, or for export. Customs Form 28 (Customs Request for Information) A form used by CBP to request additional information on a Customs entry, or to request a sample or documentation. The request is generally to assist Customs in determining admissibility, HTSUS classification, or Customs value. The form includes all necessary references and instructions, including the timeframe for response and procedure for extension. Failure to respond may result in duty increases, cargo examinations, compliance assessment, or other Customs actions. Customs Form 29 (Customs Notice of Action) A form used by CBP to advise an importer of record that a change affecting the tariff classification, Customs duty rate, or Customs value has been taken or is proposed. If the action has been taken, Customs entry liquidation will reflect the change. If the action is proposed, the importer may submit additional information according to the instructions on the form. If the importer does not respond within the stated time frame, the action will be taken by Customs. Customs Form 4647 The Customs Form 4647 Notice to Mark and/or Notice to Redeliver as the name implies, is a dual purpose form. In most cases, the notice is generated because the subject imported merchandise is not legally marked with the country of origin. The importer must mark the goods and certify he has done so to Customs. The goods may not be sold or distributed until Customs has concurred with the marking. The alternate use, as a notice for redelivery, is usually a more serious matter, and will often lead to liquidated damages. A redelivery notice is a demand by Customs for a return to Customs custody of merchandise which, subsequent to its release, is determined by Customs not to be entitled to enter the commerce of the United States. Customs Form 7501 (Entry Summary) The entry summary is filed on a CF7501 and is used for the payment of duties, taxes, and fees to CBP. The CF7501 contains all shipment data including merchandise description, the tariff number under which the merchandise is classified, and the value. The entry summary is used for most entry types, but not for transportation entries. For consumption entries, the CF7501 is to be filed with estimated duties attached within 10 working days of the shipment release. CES (Centralized Examination Station) This term refers to a commercial bonded facility designated by CBP as an official cargo examination site. CFS (Container Freight Station) A cargo transfer terminal/facility engaged in the receipt of loose or unitized breakbulk cargo, organizing such cargo into container loads, and loading (“stuffing”) such loads into outgoing intermodal containers or airfreight containers. A CFS is also a bonded area to hold cargo pending the filing of an entry and release from Customs. Commodity Classification A term used to describe the category or line item which a product or commodity falls under within a tariff or other commodity listing. For example, commodity classifications are used to determine applicable transportation rates, Customs duties, trade statistics, and whether an export license is required. The most common commodity classification now in use is the harmonized tariff system (HTS). Customs Bond A Customs bond is a contract which is given to ensure the performance of an obligation imposed by a law or regulation. The parties involved in the bond contract are the principal (importer, transportation carrier, CFS or bonded warehouse operation), surety company, and obligee (Customs). A Customs entry bond is required for the entry of imported merchandise into the U.S. A Customs entry bond acts as a security for compliance with U.S. law and ensures payment of duties, taxes, and fees due U.S. Customs & Border Protection. The bond is intended to protect the U.S. government in the event the importer cannot or will not fulfill their obligation to pay monies due. The bond also serves as an agreement for examination of merchandise, agreement to redeliver merchandise, and an agreement to produce documents, among other things. A continuous bond differs from a single transaction bond in that it remains in effect until either cancelled by the issuing surety or by the principal (i.e., importer, carrier, CFS, warehouse, etc.). CVD (Countervailing Duty) CVD is assessed when a foreign country pays grants or subsidies to the manufacturer, producer, or exporter of goods in order to encourage exportation or to help the exporter compete in the U.S., AND there is injury or threat of injury to U.S. industry. The payment can be direct or indirect and be in any form. Entry The act of entering merchandise consists of the filing of paper or electronic documents with the Customs and Border Protection (CBP) containing sufficient information to enable CBP to determine whether imported merchandise may be released from CBP custody. It also includes the filing with CBP of the declared value, classification and rate of duty applicable to the merchandise, and such other information as is necessary to enable CBP to properly assess duties, collect accurate statistics, and determine whether other applicable requirements of law have been met. As a general rule, all merchandise imported into the United States is required to be entered, unless specifically excepted. HMF (Harbor Maintenance Fee) Pursuant to the Water Resources Development Act of 1986, CBP collects this fee for the U.S. Army Corp of Engineers for the improvement and maintenance of U.S. ports and harbors. Most commercial cargo unloaded from a commercial vessel is subject to the Harbor Maintenance Fee of 0.125 percent (.00125) of its value. HTSUS (Harmonized Tariff Schedule of the United States) The HTSUS is used to classify cargo imported into the U.S., and assess duty thereon, and provides the requirements for reporting statistical data of such importations. The Harmonized Tariff System (HTS) is used by over 120 countries. The HTSUS is published in the United States by the U.S. International Trade Commission and contains over 19,000 article descriptions in 99 chapters in 22 sections. Informal Customs Entry This is a simplified type of consumption entry procedure that can be used for low value commercial shipments and non-commercial shipments such as personal effects or gifts. An informal entry is considered self-liquidating (i.e., there is no entry liquidation process following release of the cargo) and the importer does not have to provide CBP with a Customs bond (as long as the entry is presented as a “live” entry). An informal entry is defined as the documentation required (either electronic or paper) to secure the release of imported merchandise that is either valued less than $2000, or if valued in excess of $2000, would otherwise be released on an informal entry (e.g., personal effects and household goods). IOR Number The Importer of Record number, also commonly referred to as an importer identification number, which CBP uses to uniquely identify importers and other parties who file Customs entries and other information with CBP. For U.S. importers, the importer ID will be the IRS number or federal tax ID, or Social Security number for an individual. Non-resident importers will receive a Customs assigned importer ID. MPF (Merchandise Processing Fee) Pursuant to the 1985 Consolidated Omnibus Reconciliation Act (COBRA), Customs may collect user fees for passenger and conveyance services. The merchandise processing fee is an ad valorem rate of .3464% of the value of cargo (minimum $25, maximum $485 per formal entry; $2 per informal entry) collected as part of the Customs entry process. POA (Power of Attorney) A Customs power of attorney is a legal instrument by which a principal (importer) grants certain powers and authority in favor of an agent (Customs broker). The Customs power of attorney empowers the broker to act on behalf of its clients in transacting their Customs business. That includes those activities involving transactions with Customs concerning the entry and admissibility of merchandise, its classification and valuation, and the payment of duties, taxes, or other charges collected by Customs. Some powers of attorney include language appointing freight forwarders as agents in order to complete exports on the grantor’s behalf. Goods shipped by courier, express, or other similar service usually are expedited through customs by a customs broker hired by that commercial service and then delivered seamlessly to your door. All you have to do is pay for the duty/tax may incur and sign for the package when it arrives. In most cases delivery is quick and reliable. When there’s a problem, there is a tracking number that can help resolve the matter. When the shipment is < 1 cbm (=1 Cubic Meter =35 Cubic Foot), or 200 Kilogram (= 200 kg = 440 lbs), courier shipping such as FedEx/UPS is the best option for most cases. It can be samples, or trial orders at the beginning. You may have account with FedEx or UPS, but except you can enjoy the extremely better discount, we suggest let us handle such delivery for you. 1. We can use internal courier for pick up from the seller, compared that FedEx/UPS needs their own workers and trucks for pick up. There are various Chinese couriers around, which have better pickup fee. 2. Our account has better discount since the large quantity shipments we had and have been sending with them. It’s the same as you place orders directly in FedEx/UPS, but with lower cost. Sea freight can be economical, and the best way to handle large bulky purchases. U.S. Customs and Border Protection (CBP) does not require any customs license/permit when importing, only if you are a U.S. citizen. CBP entry forms do ask for your importer number: this is either your IRS business registration number, or if your business is not registered with the IRS or you do not have a business, your social security number will be sufficient. But you may also need a license from local or state authorities to do business. Specific items such as: food products, plant, animal, dairy, prescription medications, toys may need additional certificate (e.g., FDA, EPA, DOT, CPSC, FTC) from other agencies. If you are in or near such city, chances are big that the freight cost can be a little cheaper while the transit time can be a little shorter. Generally, you don’t need to pay much attention on where’s your nearer ocean port. The developed rail and trucking network across the whole country make transport easier to any places in the US. If the value is less than $800, none duty/tax at all. If above, you can add the seller quote + our freight quote + duty/tax below for the total landed cost. 1. Determine the HTS Code. * In Column 1. This is only an estimate for what the duty amount on an item might be, only CBP can make a final determination about what is owed. 3. Other taxes or fees. The duty/tax is based on the value of the merchandise being imported, not including duty, freight, and insurance charges. Attention: The textiles have an average duty rate 16%, which is higher than most products. Obviously the textile sector is a key component of the U.S. economy. Prior to shipping, importers will need to have a customs bond on file prior to their shipment’s departure. This is for ISF 10+2. If the value is less than $2,500, then they can import under an informal entry and without a bond, but this process would require them to manually submit paperwork, which is not recommend. There are two types – single entry and continuous entry. Single entry bonds are for a one-time use, and can be purchased for around $100 – $200. Continuous entry bonds cover all your shipments over a whole year. It’s about $350 – $500. As you can see, if you import more than 3 times a year, an annual bond will be better cose-effective. If the importer is an individual using social security number, we need a driver’s license copy and birthdate on the POA. If the importer is using a corporation using IRS number, we need a document that authenticates a valid IRS number and address (e.g. correspondence letter from IRS or SS4 or W9). Proof tax filling as copy. Also social security card. American freight has strict restrictions on HS and weight. Different HS means different freight charges. And the container weight cannot be heavier than 17 ton for a 20GP, 19 ton for a 40GP. So pay more attention on goods of metal, tile, stone products. United States, which is 363kg/cbm. dimensional weight rate is $0.22 per kg (80/363). Shipping to the east coastshould take roughly 25-30 days; to the west coast this is closer to 15~18 days. These are only rough guides and do not account for delays, the transit duration will also be dependent on the carriers used. Besides, 1-3 weeks may be needed for the internal delivery in the U.S. after arrived at port of entry. You can learn more about air transport, ocean transport, express transport, or you can request a free quote now.